"Help! My iPhone 7 is stuck in continuous reboot loop and the Apple logo comes and disappears on screen." "My iPhone gets stuck endless boot loop after upgrading to iOS 11 Beta version. What should I do to fix it?" That iPhone keeps restarting itself is a common issue and usually happens caused by many reasons, including updating to iOS 11 on iPhone 7 Plus/7/6s Plus/6s/SE and etc. However, no matter what cause it is, you can also easily fix the iPhone stuck in reboot loop issue with the the instructions provided here in this article. A new software update on iPhone also may get your iPhone stuck during the updating process, which may make your iPhone keep rebooting. If the battery connector on iPhone goes wrong, the malfunctioning battery connector will not get your iPhone enough power charged, which will lead to the boot loop. When Jailbreaking an iPhone, if you don't operate it properly, your iPhone may break down and cause many other problems. First of all, you can check the battery connector of your iPhone. If it is malfunctioning, it could be the reason to cause iPhone boot loop issue and you can fix your iPhone by repairing the battery connector to get your iPhone enough power so as to get rid of the endless rebooting problem. And if your iPhone's battery connector really has problem, you'd better send your iPhone to the repair shop to fix it instead of fixing it by yourself in case of damaging iPhone mistakenly. See Also: My iPhone Won't Update, How to Fix It? 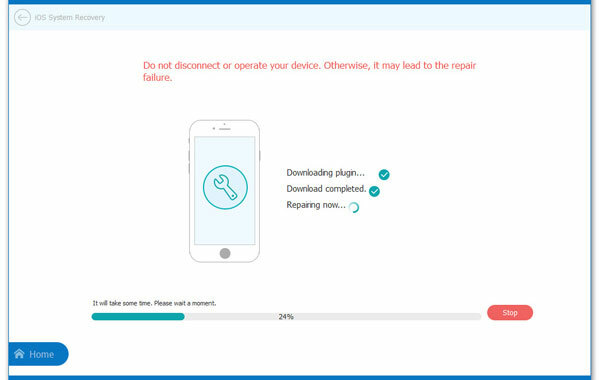 Most of the time, you can restore your iPhone and get it back to normal from different iPhone errors, including iPhone stuck in boot loop issue. However, please be aware that putting iPhone into recovery mode to fix your iPhone will erase all data from your device. So it is recommended to backup all important files on your iOS device before the process. Step 1. First of all, please don't connect your iPhone to the USB cord for now, but make the other side of USB connected to your computer. Step 2. Run iTunes on your computer. And please be sure you have installed the latest iTunes on your computer. If not, go to Help > Check for Updates on iTunes to get a latest version of iTunes. Step 3. Then turn off the iPhone by pressing and holding the Home and Power button on your iPhone. Step 4. Next, please connect your iPhone to computer with the other side of USB cable after your iPhone has been turned off. Then continue to hold the Home button, and let go of it when a "Connect to iTunes" screen appears on your iPhone. Step 5. Thus your iPhone has been in the recovery mode successfully. And you will receive a notification from iTunes, asking you to restore or update your iPhone. Just click Restore option to fix iPhone stuck in boot loop issue. Note: For iPhone 7 or later iDevices (including iPhone 7 Plus, iPhone 8, iPhone 8 Plus, iPhone X), please press the Volume Down button instead of the Home button, for there is not a real Home button for new versions any more. See Also: iPhone Keeps Freezing? 6 Methods to Fix It! If you have not made a backup before the iPhone stuck in boot loop issue happens, or if you are worried about losing data when restoring iPhone with recovery mode, or you just want a simply but secure solution to fix your iPhone error, you can skip the above methods and just take the way in this part to solve your iPhone problem. To effectively and safely fix your iPhone issue, it is highly recommended to ask for help from a professional third-party tool - iOS System Recovery. With this tool, you can easily fix iPhone stuck in boot loop without hassle. This tool specializes in fixing all kinds of system problems for all models of iPhone, iPad and iPod touch. Now, you might download the software in Mac or Windows version on your computer, then follow the instructions to fix your iPhone. Run the iOS System Recovery software on your computer, and get a USB cord to connect your iPhone to PC. Then switch to "More tool" > "iOS System Recovery" on the main interface. The program will automatically detect the possible system problems of your iPhone, and display them like Stuck in boot loop, Red screen of death, Stuck on Apple logo, Recovery mode, iPhone Error 9006 and etc. Just hit the "Start" button to move to the next step. The last step is to confirm your iPhone information. If it is correct, just hit "Repair" option to begin fixing your iPhone stuck in boot loop error. If not, select the right one and then hit "Repair" button to begin the restoration process. To restore your iPhone, the program will automatically detect your iPhone's current iOS version, then download and install the latest one on your device.